Without seeing this year's dueling animated Halloween flicks, it might be hard to imagine any critic liking the Adam Sandler-starring "Hotel Transylvania" more than the Tim Burton-directed "Frankenweenie." Sandler is infamous for appearing in lowest-common-denominator fare such as this year's "That's My Boy" and 2011's unwatchable "Jack and Jill," while Burton has acquired three decades of quirky-cool cachet that even a box-office disappointment like "Dark Shadows" can't dim. Then again, the holiday is made for surprises. 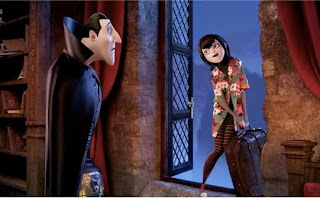 Sandler's colorfully CGI-animated "Hotel Transylvania," about a vampire who is extremely overprotective of his teenage (well, 118-age) daughter, is a manic and anything but subtle comedy. Yet for pure entertainment value and good looks, it beats the neck bolts off the dull, black-and-white and dismally "arty" "Frankenweenie." TV's "Wizards of Waverly Place" star Selena Gomez, who had so little presence in last year's "Monte Carlo" that she disappeared into the background of her own movie, turns out to be great at supplying the voice for an animated character. She's Dracula's now grown and hyperactive daughter Mavis, a charmer with a cute pixie-cut hairdo, a tiny black-lipsticked mouth and a sweetly optimistic (as opposed to rebelliously obnoxious) adolescent attitude. She wants to see the world beyond the Hotel Transylvania resort that her father built as a hidden-from-humans refuge for vacationing monsters. All of dad's friends show up for Mavis' 118th birthday party, a monster mash featuring a terrific all-star voice cast. Steve Buscemi shines as deadpan Wayne the Werewolf, miserably putting up with a rowdy pack of pups. CeeLo Green is the full-of-life Murray the Mummy, David Spade is Griffin the Invisible Man and Jon Lovitz is the hotel's humans-hating head chef Quasimodo. Kevin James is a blue-skinned and sometimes dismembered Frankenstein (aka "Uncle Frank"), and Fran Drescher is his nagging wife Eunice. Sheltered-since-birth Mavis has no friends her own age. That changes when human backpacker Jonathan (Andy Samberg) accidentally wanders into the festivities. Jonathan is so go-with-the-flow dopey that at first he's oblivious to the fact he has stumbled upon a hotel full of real monsters. After first trying to hide him, Dracula disguises Jonathan as one of Uncle Frank's nephews in an attempt to keep the hotel's guests from realizing a human is in their midst. Mavis naturally regards him as potential boyfriend material, and predictable but enjoyable complications ensue. The movie's sense of humor is often corny but fun. Asked if it's true that a wooden stake through the heart will kill a vampire, Dracula replies, "Yeah, well, who wouldn't that kill?" He also explains that he quit fanging necks long ago because "human blood is so fatty, and you never know where it's been." Bagels are smeared with "scream cheese," an empty suit of armor that gets kicked in the crotch wonders "why does that hurt me?" and the hotel limo is a glass-walled hearse. First-time feature director Genndy Tartakovsky, a veteran of Cartoon Network series including "Star Wars: Clone Wars," "Samurai Jack" and "Dexter's Laboratory," keeps the story moving at a pace that sometimes feels a little over-amped but definitely never drags. The completely kid-friendly screenplay is by "Borat," "Bruno" and "Arthur Christmas" co-writer Peter Baynham and "Saturday Night Live"'s "Saturday TV Funhouse" creator Robert Smigel. Also, this is the rare animated movie these days that's not saddled with a dated classic-rock soundtrack. If your budget's tight and your little monsters only get to see one Halloween flick this year, check the family into "Hotel Transylvania." That other movie is for the dogs.